Jake Grant and Tom Agars, members of the winning Cold Fusion team during the eighth world finals of the F1 in Schools competition (Abu Dhabi, 2012) have arrived at City from Australia to take up their top prize engineering scholarships. Jake Grant and Tom Agars, part of the victorious Cold Fusion team winning first place at the 2012 World Finals of the F1 in Schools competition in Abu Dhabi, have arrived at City from Adelaide, Australia, to take up their three-year scholarships for MEng Mechanical Engineering and BEng Aeronautical Engineering degrees respectively. City has been a major partner of the F1 in Schools programme, offering scholarships each year to the winners of the annual world final competition as the top prize. Jake and Tom were students at Brighton Secondary School in Adelaide, Australia. F1 in Schools aims to assist in changing the way science, technology, engineering and mathematics (STEM) is viewed by creating a fun and exciting learning environment for young people to develop an informed view about careers in engineering, Formula One, science, marketing and technology. Students are given a brief to design a model compressed air powered F1™ car of the future using computer-aided design/computer-aided manufacturing (CAD/CAM) engineering techniques. Cars are then manufactured on a computer numerical control (CNC) machine. Each team of between three and six students brings together their portfolio of work to present to a judging panel with a verbal and written presentation to support their model car, which is raced on a specially designed test track. At the world finals, each team has an opportunity to bring along a pit display, their cars and portfolio and a verbal presentation for the judges. "City's mechanical and aeronautical engineering department is delighted to be involved in the F1 in Schools programme through which we promote STEM subjects in schools and support young students to develop their skills in the use of CAD/CAM, CNC machines and testing. We are pleased to be awarding three-year scholarships to two talented students to study with us from this year: Jake Grant, for the MEng in Mechanical Engineering and Thomas Agars for the BEng in Aeronautical Engineering." "It's great to see two of our F1 in Schools alumni taking up City's generous scholarship and we wish Jake and Tom all the best in their degree courses. We're indebted to City for its support of F1 in Schools and helping us to assist talented students in achieving their ambitions and following their chosen career paths." Jake was taken on a tour of the City engineering labs on 15th September, accompanied by Team Principal of the City Racing Team Roger Valsler, Jake's father Don Grant and F1 in Schools' director of communications and events, David Howes. 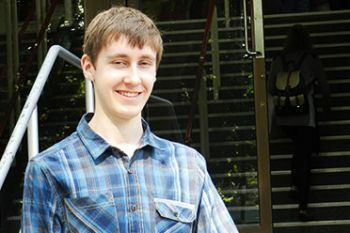 Jake is "pleased to be studying at City" and is "keenly looking forward to the challenges of the engineering courses".